Pip Edwards is down to earth, she is full of energy and personality and is one of the nicest people you will meet in the Australian fashion industry. The first time I met Pip was about two years ago, and I was nervous, but I quickly realised that I didn’t need to be. She’s just a cool girl who has time for everyone. Pip has worked for Ksubi, Sass and Bide and now she is the Design Director at General Pants. 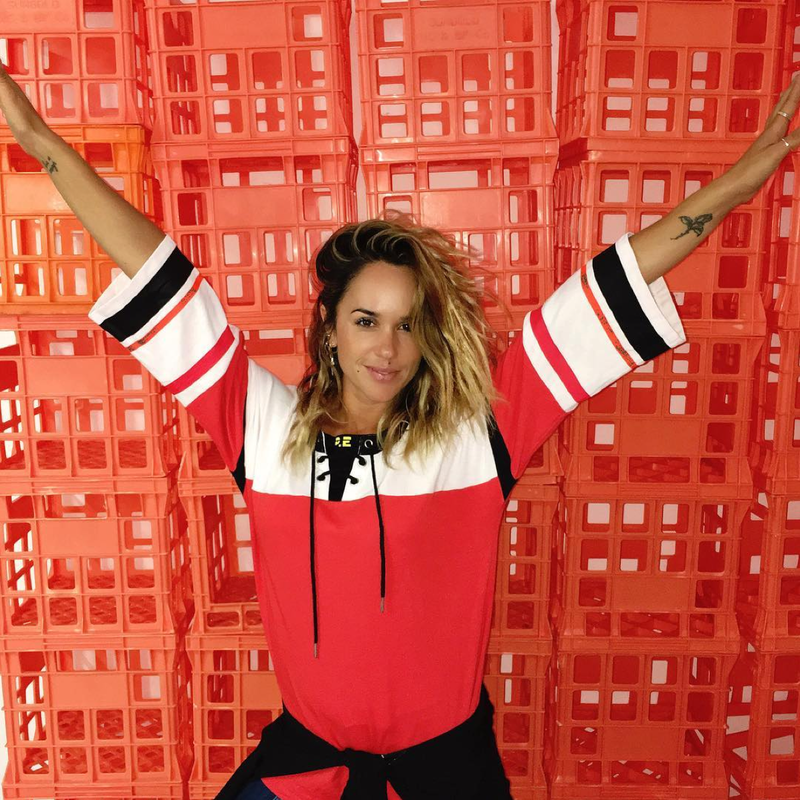 2016 is such an exciting time for her as it marks a new chapter in her career – the launch of P.E NATION, an exciting active wear label she launched alongside Claire Tregoning, former Sass & Bide senior designer. The range embodies Pip’s tomboy attitude and a true retro feel. Today I have shot a small selection, but the entire collection is filled with blocked jerseys, jumpers and jackets, checked swimmers, tights. To sum it up, each piece is cool AF. You best check it out for yourself, here. Keep scrolling to read my latest interview with Pip, and find out her inspiration, her biggest career risk to date and what’s on her travel list this year. We’re four months into the year, what is your biggest inspiration at the moment? Fitness and healthy living is top of my list this year. P.E Nation would have to be my biggest inspiration – which definitely encourages fitness and healthy living!!! Who are your go to labels at the moment? Bec & Bridge, Camilla and Marc, Ksubi, Shop Re Done jeans. Well I have a few amazing vintage finds. When I was the senior creative at Sass & Bide, we used to travel the world on “inspiration” trips with Heidi and Sarah-Jane and we would scour vintage markets – I cant even begin to tell whats my favourite find – they all have their own memory and are all amazing. I would never ever part with my vintage pieces. Where is on top on your “must travel” list this year? Mykonos and Santorini. Lucky I am actually going to both!!! If I’m really lucky, I just might make it to Croatia as well. You love shoes, do you know how many you own? Hahaha impossible to answer. And even if I knew the answer I’m not sure I could tell you – its kind of outrageous as to how many shoes I own. I have an pretty awesome heel collection but I think my trainer obsession is taking over. Congrats on P.E Nation. What was yours and Claire’s vision for P.E Nation first collection? The vision of P.E is all about a nostalgic nod to the retro sports vibe, yet with a tomboy attitude. Basically P.E is what Claire and I have been wanting to find in the active wear space but no-one was really offering it. What is your most coveted piece from the collection? Hmmmmm The jackets are pretty special, especially the “A Train”. But my favourite piece is the Rocky Mesh. Purely because of its versatility. Its awesome with a sports crop and leggings, but is also great teamed back with denim. P.E is about versatility and functionality whilst being fashionable. Were the design decisions from sampling to production difficult, or easy? There are always the usual hiccups with design from fabrication to cost … these just the everyday issues every fashion brand goes through. Active wear is interesting as its all about innovation and tech fabrics – and this takes time to develop and volume to drive the best results. So as we grow each season, you will see us expand our offering. I think it will only get more exciting. How long was your design process from conception to production? Its would have a been a full year between conception of the debut collection to delivery in store!!! Fitness is such an important part of your life. What is your favorite work out at the moment? I absolutely love soft sand running – its my favourite exercise as you see results. But recently I’m getting right back into my F45 circuit training to develop my strength. I also love pilates and try to squeeze that in once a week. What was the last song you played on your iphone / spotify? What is the biggest risk you’ve taken with your career? P.E NATION for sure!!! The decision to finally branch out do my own thing, my own way, utilising my own initials!!! After years of working with brands and working for brands, I totally feel vulnerable and exposed but I’m finally doing what I love, it’s the culmination of all my learnings along the way.